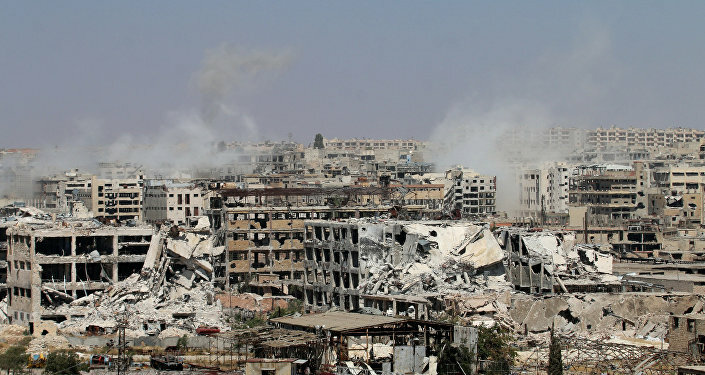 Iranian correspondent Hassan Shemshadi, who is currently reporting from the ground in Syria, has told Sputnik Persian about the recent developments on the ground and explained why the battle of Aleppo is of particular importance to the ongoing Syrian crisis. Here is his first-hand account. 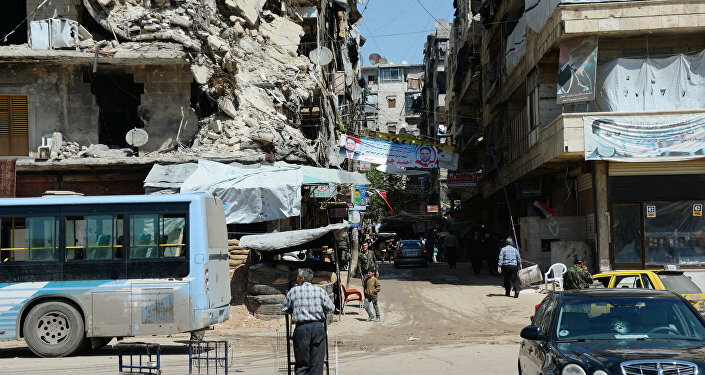 “About ten days ago the militants were forced to flee towards Aleppo’s northern boundary, towards the border with Turkey, after their only supply route which heads to the militant-controlled areas of Aleppo city, the Castello Road, have been cut,” Hassan Shemshadi told Sputnik. As a result, the Iranian journalist said, around 400 terrorists have been encircled by the Syrian Army Forces and its allies on a vast territory in the southeast of Aleppo. The militants are unable to get any support or supplies. 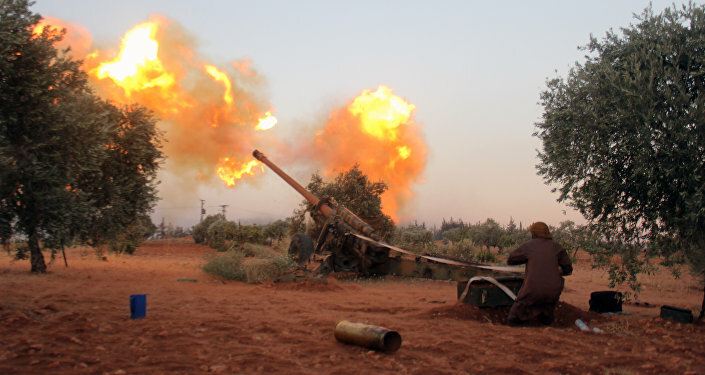 However, 22 brigades and five major terrorist contingents were able to unite and are launching attacks on the Syrian government forces and their allies to retake the control over the Castello Road. They are trying to reach out to other militant units which currently control some eastern, north-western and north districts of the Aleppo Governorate to gain the support to be able to flee towards the northern border with Turkey to get a break after heavy losses. The journalist noted that the severe fighting is taking place ahead of the next round of intra-Syrian talks in Geneva, which are scheduled for the end of August, where vital decisions on the country’s future will be made. The UN Special Envoy for Syria Staffan de Mistura is now holding active consultations with all the parties to the Syrian conflict. Hence both the Syrian army with its allies on the one hand and the terrorists and their patrons on the other, are fighting a fierce battle for Aleppo in order to have an ultimate ace up the sleeve by the start of the talks and proudly stand their ground. Hassan Shemshadi has also commented on the recent allegations of the London-based Arabic-language newspaper Asharq Al-Awsat of the involvement of the head of the Iran’s Revolutionary Guards' elite Quds Force, General Qassem Soleimani in the fighting on the ground in Syria. “This is just speculation and rumors,” the journalist told Sputnik. This particular newspaper is an affiliated media outlet of the sponsors and patrons of the terrorists in Syria, he explained. Its sole purpose is to destabilize the balance of information — especially amid heavy losses of the militants when they were circled in Aleppo. This is not the first time this issue is being raised, Shemshadi said. However, he added, it is important to understand that throughout the five years of the Syrian war the Iranian military advisors have been providing consulting and military assistance to the Syrian government and its army at the front line of its fight against terrorists. During the recent military operations their role has increased but there is no question on the agenda of sending Iranian special forces, including Iran’s Basij Armed Force, into the epicenter of the battle. It is quite hard, besides, there is no need for it, the journalist said. As before, all the special operations on liquidation of the terrorists are being conducted by the Syrian Army, People’s Protection Units with the aerial support of Russian aviation and the support of Iran and Lebanese military units. This particular coalition has many successes and overwhelming victories on the battlefield. In addition, the information in question ultimately contradicts the UN position and its announcements ahead of the new round of Syrian peace talks. Its purpose, suggests the journalist, is to provide an excuse for the terrorist’s patrons if they fail at the upcoming talks. They could then accuse Iran of not complying with some agreements and of not being interested in the peaceful settlement of the conflict but rather in a military solution to the crisis. Meanwhile Iran has repeatedly said that it supports a peaceful dialogue as the only solution to the Syrian internal conflict. There is an information war in its full swing, the journalist stated.